Create a report called Awards Season and add a data source which connects to the Movies database. Add a dataset which selects the fields shown below for films with at least one Oscar nomination. You can either add a WHERE clause to the query or add a filter to the dataset to return the Oscar-nominated films. OscarWinRate - divide Oscar wins by Oscar nominations. CostPerNomination - divide budget by Oscar nominations. 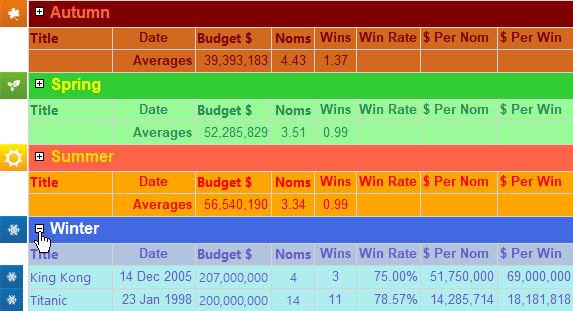 CostPerWin - divide budget by Oscar wins (remember that some films didn't win any Oscars). Apply some basic number formatting to make the data readable. Spring - the release date is between March and May. Summer - June to August. Autumn - September to November. Winter - December to February. Check that you see the correct season name next to each film. Feel free to create a less offensive colour scheme. Right-click the Images folder in the Report Data window to import pictures. Make sure the image names match the season names! You may need to adjust the column width. It should take you some time to achieve this! Win rate - The sum of Oscar wins divided by the sum of nominations. Cost per nomination - The sum of the budget divided by the sum of nominations. Cost per win - The sum of the budget divided by the sum of wins. Apply some number formatting to make the results readable. Add a filter to the dataset so that it returns only films that were released in the same month as the current date. Running the report in November should return only films released in that month. You could apply interactive sorting as a final flourish.